Something should be done and urgently to raise the motivation and the enthusiasm of pupils. 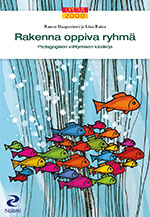 This book offers a thing called pedagogic thriving as a solution. By knowing the group phenomena and directing a group in a target-oriented way one can govern the atmosphere of learning. If you want to benefit from the pedagogic possibilities of the learning groups, you have to get to know their dynamics and you have to practice the directing of these groups. What is important is that the teacher's and pupils' worlds come across better and that the teacher assumes his or her role as a group director instead of trying to teach individuals in a classroom. This book provides you with hints on detecting and benefitting the group phenomena as well as on directing among the pupils or in collaboration with fellow teachers. Teacher who develops an atmosphere that reinforces the pedagogic thriving in a group leans on three cornerstones in his/her actions: appealing to the curiosity of the pupils, seeing to the security of every member of the group and making the active intereraction possible.